You’ve just started your blackberry jam and you open the cupboard to discover you’ve run out of pectin. The stores are closed, the kids are in bed, you’ve already taken off your bra – no way you’re going to the store! No worries, grab a few apples and you can finish that tasty batch of blackberry jam with this shredded apple pectin replacement. Blackberries, like most fruit, fluctuate between a high and a medium pectin fruit. You can read this really clear breakdown of high and low pectin fruits at Pick Your Own for more information on other fruits, too. This article also gives a good overview of how pectin works. I finally have a list I compiled and just shoved in my canning book for quick reference. If you’d like a copy of that for FREE, just click here to download it. When I go to make blackberry jam, or any other low pectin fruit jam for that matter, I look quickly at my chart to see if I can reasonably mix in any high pectin fruits. Mixed fruit jams are great for the end of season harvests when you have a bunch of random produce leftover. However, it’s also handy to mix in a high pectin fruit for a better set to jams and jellies. Another way to mix high and low pectin fruit is to pick slightly under-ripe fruit along with the ripe ones. In the case of blackberries, you can pick some slightly under-ripe berries along with the smooshy, sweet ripe ones to mix into your blackberry jam for a firmer set. Running out of commercial pectin doesn’t have to be a crisis when you’re making blackberry jam. In fact, some people regularly make their own pectin. You can even can your homemade pectin to use later. Read the following posts to learn how to make your own pectin. Pay attention to canning instructions and suggestions on how to determine the quantity of homemade pectin you should use in something like blackberry jam. How to Make Pectin from Apples from A Farm Girl in the Making. Homemade Citrus Pectin from Spruce Eats. If you want to do some extra curricular reading on pH and Water Bath Canning just read this post from Food in Jars. If you want to do even more reading on pH meters and testing acidity in your home-canned foods, click here. Most of the time, if you follow tested recipes and are careful about adding enough sugar and pectin, citric acid or lemon juice as called for, your jams will be safe. The following is a recipe for blackberry jam made with under-ripe shredded apples as a substitute for pectin. If you have ripe Granny Smith apples, those would work, too. As a general rule, remember that the more ripe the fruit, the less pectin it will contain. If you’re canning with kids in your kitchen, please be sure to read this post on keeping them safe and you sane. This is a simple blackberry jam recipe that includes shredded apples instead of commercial pectin. This recipe can be cut in half, if necessary. Place a metal spoon in your freezer. Wash blackberries and apples. Core apples, but do NOT peel. Combine apples, blackberries and lemon juice in a large, heavy bottomed pot. Cook until soft. Add sugar and stir to dissolve. Cook on medium-high heat until boiling, stirring constantly. Cook until mixture is reduced by at least a third, possibly a half. Don't forget to stir to prevent scorching! After mixture has reduced, remove spoon from freezer and scoop a bit of jam onto it. Do "the spoon test" as per the instruction in the "Notes" section. Bottle quickly into pint jars, remove air bubbles with a knife down the inside of the jar, wipe rims and place seals on top. Process in a water bath canner for ten minutes, adjusting for your altitude. To conduct "the spoon test" to test for jam set, do the following. Place some jam on your frozen spoon. Watch to see if the jam sets up on the spoon after about a minute. Dump the fruit part back into the jam in the pot and run your finger down the spoon in the syrupy stuff left behind. Does your finger leave a trail? Is the syrup holding its position? If so, your jam is ready to be bottled and canned. If not, you can add a 1/2 cup more sugar if you'd like and/or continue cooking and stirring until set has been achieved. 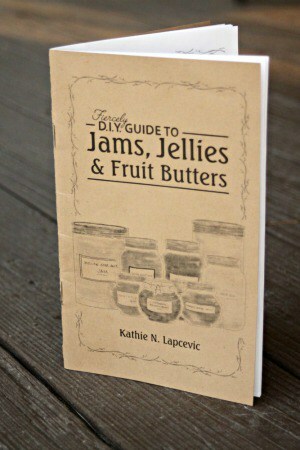 Incidentally, Kathie from Homespun Seasonal Living has a handy little book on unique jams and jellies that you might want to check out. These home-canned treats make excellent gifts for the coming holiday (or any!) season, FYI. ‘You’ve already taken off your bra you’re not going to the store…. I’m a newbie here and loving it so informational thank you! You’re quite welcome, Arianna – so glad it was useful! Home canning isn’t always convenient (seriously, I never run out of stuff when I can get to the store), but it’s SO worth it! If you’re new, be sure to check out https://simplycanning.com – it’s my go-to resource. Also, https://homespunseasonalliving.com has a lot of unique jam combinations and fun things to put up. https://schneiderpeeps.com does, too, and all her recipes are economical and good for larger families. I’m sure there are more great sites that I’m just not remembering right now, but those three should be able to help you along.